We study the evolution of galaxies in the Universe with computer simulations. 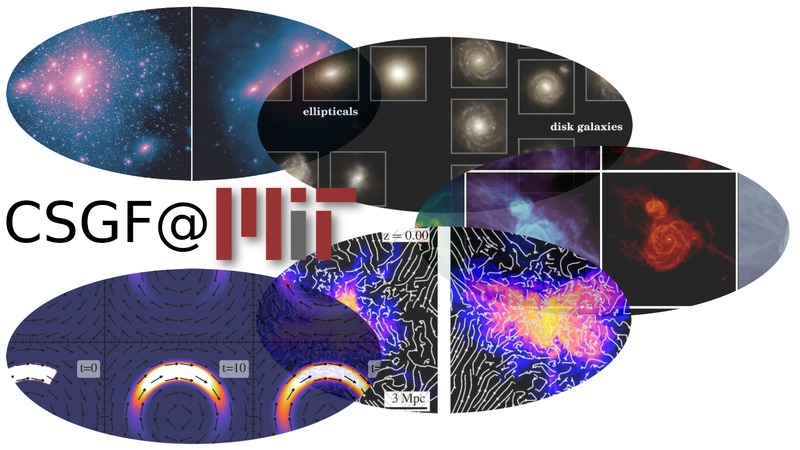 Our goal is to develop predictive large-scale galaxy formation models and simulations to understand how structures and galaxies form in the Universe. Explore our website to find out more! Galaxy Zoo: Classifying Galaxies from Another Universe. First high redshift JWST predictions for ETHOS model (An Effective THeory Of Structure Formation) submitted. First IllustrisTNG papers have been released. Rahul Kannan wins Einstein and ITC Fellowships 2017. Letter on thermal conduction making AGN feedback more efficient submitted. First study of dust content of galaxies using hydro simulations with self-consistent dust model submitted. Mark Vogelsberger wins Alfred P. Sloan Research Fellowship 2016. Paul Torrey wins Hubble Fellowship 2016. First two ETHOS (An Effective THeory Of Structure Formation) papers submitted ( paper 1 and paper 2). Astrobites discusses our recent paper: A Magnetized Universe - How galaxies are influenced by magnetic fields. Illustris public data release available.